Aiva. ​Aiva uses Google Home, Amazon Echo and other smart speakers to not only engage and empower patients and seniors, but also to connect them more closely to their caregivers. The voice OS is built on a suite of enterprise applications -- a mobile app for caregivers to manage help requests, a dashboard for performance reporting, and a backend for controlling the voice assistants’ settings and their interaction with other IoT smart devices like TVs, lights and thermostats. Learn more at AivaHealth. Beyond Verbal. Beyond Verbal is developing voice-enabled AI solutions to create proprietary vocal biomarkers for personalized healthcare screening and continuous remote monitoring of health and emotions. We are now having access to an extensive database of over 150K patient records with over 1 Million anonymized voice recordings. Our internal database has grown to include more than tens of thousands of labeled patient records, correlated with their medical records. Learn more at BeyondVerbal. CarePassport. 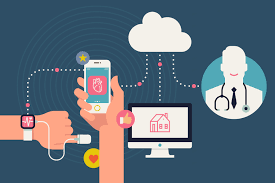 Patients benefit from a single medical app to support them throughout their medical journey. Find clinics and hospitals nearby your location, request and manage appointments, view your care providers’ contact information, and communicate with them via secure messaging. Patients can view their medical records and securely share with their healthcare providers. CarePassport allows patients to receive educational materials related to their care, authorize family members to access their information through secure proxy settings, and use navigation maps to drive to their appointments or arrange rides via Uber. Learn more at CarePassport. EchoCare. EchoCare Technologies has a radar-based, non-wearable, elderly-care, home monitoring system that automatically alerts safety and emergency situations. The ECHO system is a connected, machine-learning, Advanced-PERS (Personal Emergency Response System) that includes a disruptive fall detector with very low false alarm. In addition to unprecedented fall detection capabilities, the ECHO system detects and alerts on other emergency situations, such as sleep apnea, hyperventilation, abnormal situations, and change from elderly daily routines. Learn more at EchoCare. GetWellNetwork. The company’s GetWell Loop™ enables care teams to engage all patients before and after admission through automated daily check-ins. By sending the right information at the right time, GetWell Loop identifies those patients that need help in real-time, allowing care teams to reach more patients and proactively intervene before costs and complications escalate. Lear more at GetWellNetwork.